Haptic VR systems exert dynamically varying forces on virtually embodied users. VR approaches have always presented ergonomic challenges, but the emergence of adaptive haptics makes it increasingly difficult to maintain good posture. 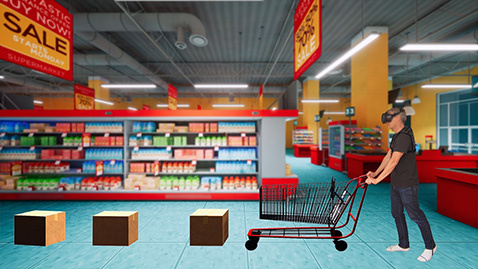 We look at the example of pushing a virtual shopping cart to explore relationships that exist between posture and adaptive haptics. Two experimental studies demonstrate (1) a direct effect of adaptive haptics on poor posture; and (2) that real-time feedback improves posture, even under significant dynamic musculo-skeletal loading. Our findings suggest it is important to incorporate posture feedback in haptic VR design, and we also show that the resulting good posture extends beyond feedback.